An Anonymous hacker is pictured in Lyon, France in January 2012. 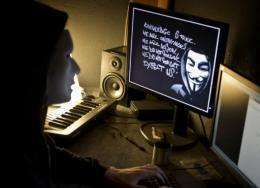 Activists claiming affiliation with the hacking group Anonymous published about 2,700 emails Sunday purportedly between Tunisian Prime Minister Hamadi Jebali and other members of his government. A mask-wearing man in a video posted online said the publication had been prompted by recent events in Tunisia, notably the violent dispersal of a rally for unemployed people on Saturday in which several were injured. "Government of Tunisia, we have kept secret a large part of your information," the masked man said. "If you do not want to see this published, we call on you to avoid online censorship, respect human rights and respect free expression." Nejib Gharbi, a spokesman for the ruling moderate Islamist party Ennahda, told AFP that some of the published emails were genuine but most were fake. Tunisia last year underwent a revolution in which autocratic president Zine El Abidine Ben Ali was overthrown. Ennahda won the most seats in October elections for a constituent assembly. It is the third time in recent weeks a group claiming to be Anonymous has hit Tunisia. Several Facebook pages belonging to Islamist parties were hacked in mid-March and a few days later the ministry of justice's site was attacked.